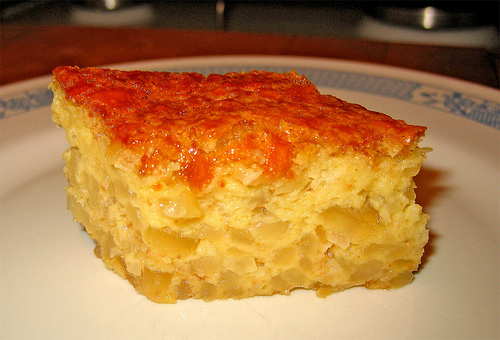 Of all the Easter pies, one of the Italian favourite dessert is rice pie (torta di riso). Many regional variations for it as usual in Italy for this delicious recipe, but most sweet rice pies are made from eggs, rice (Arborio), ricotta cheese, and citrus (orange or lemon). The Italian rice pie is like having two pies in one! When it bakes, a bottom layer of dense rice forms while the top is a separate layer of lemon-laced custard. The directions? Here it is, simple as ever: stir the flour and baking powder together in a bowl and set aside. In a second large bowl, cream the butter and half a cup of sugar. Afterwards, beat in 3 eggs, one at a time, and stir in the vanilla. Then beat in the flour mixture to make the dough and divide it in half to have the final two balls. Flour a surface, roll out each ball to fit two 10 inch pie plates. Line the pie plates with the crust, and refrigerate until needed. Bring the water to a boil in a saucepan, and stir in the rice. Stir in the milk and stir until the mixture thickens. When it is cooled down, preheat oven to 325 degrees F or 165 degrees C. eat Use the ricotta cheese, and add 1 1/2 cups of sugar, lemon juice and lemon zest.Finally add 6 eggs together in a mixing bowl. Stir in the cooled rice mixture and pour into the pie shells. Put all in the preheated oven until the filling is set and tops are golden brown. it will take more or less 90 minutes. Remember to serve it at at room temperature!!! This entry was posted on Wednesday, January 25th, 2012 at 4:10 pm	and is filed under Italian Recipes and Food. You can follow any responses to this entry through the RSS 2.0 feed. You can leave a response, or trackback from your own site. « Winter Festivals in Italy: come and have a go!